Early middle school is a great time for children to start their mathematical circle education. This time is a period of curiosity and openness to learning. The thinking habits and study skills acquired by children at this age stay with them for a lifetime. Mathematical circles, with their question-driven approach and emphasis on creative problem-solving, have been rapidly gaining popularity in the United States. 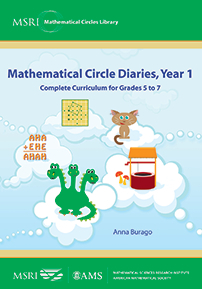 The circles expose children to the type of mathematics that stimulates development of logical thinking, creativity, analytical abilities and mathematical reasoning. These skills, while scarcely touched upon at school, are in high demand in the modern world. This book contains everything that is needed to run a successful mathematical circle for a full year. The materials, distributed among 29 weekly lessons, include detailed lectures and discussions, sets of problems with solutions, and contests and games. In addition, the book shares some of the know-how of running a mathematical circle. The curriculum, which is based on the rich and long-standing Russian math circle tradition, has been modified and adapted for teaching in the United States. For the past decade, the author has been actively involved in teaching a number of mathematical circles in the Seattle area. This book is based on her experience and on the compilation of materials from these circles. The material is intended for students in grades 5 to 7. It can be used by teachers and parents with various levels of expertise who are interested in teaching mathematics with the emphasis on critical thinking. Also, this book will be of interest to mathematically motivated children. Teachers, parents, research mathematicians, undergraduate and graduate students interested in teaching extracurricular math to school children.